We currently don’t have any babies available. Please email us at RedHeadedAng@gmail.com to be notified of future litters. We are a family based cattery in Idaho where our cats are family first. In 1996 we adopted our very first Sphynx, and the rest is history. 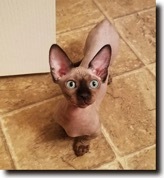 Over two decades, we’ve expanded our naked lines to include our long legged Sphynx, Elf cats (curled ears), Dwelf cats (curled ears short legs) and Bambinos (straight ears short legs). All of our cats live in the home with us, and are our pets first. We stand behind our kittens, and work to find the perfect kitten for you. Take a look at our kittens and if you see someone that steals your heart, drop us an email at RedHeadedAng@gmail.com. If you prefer, I have a text line of 623-694-3800. Know that adoption is just the first step. We remain available to you afterwards for questions, or just to share the photos and stories that you’ll have with your new family member.